Gujarat Assembly election: Few seem happy with the BJP’s rule, yet it still controls the state. Why? Few people seem happy with BJP’s rule in Gujarat, yet the party still controls the state. Why? In April 2017, Scroll.in’s Ear to the Ground project reached Gujarat. Each of the other states covered by the project thus far – Mizoram, Odisha, Punjab, Tamil Nadu and Bihar – showed one democratic malfunction or another. What about Gujarat? Gujarat is unique in our subset of six states in having been under the rule of one party – the Bharatiya Janata Party – for 22 years. 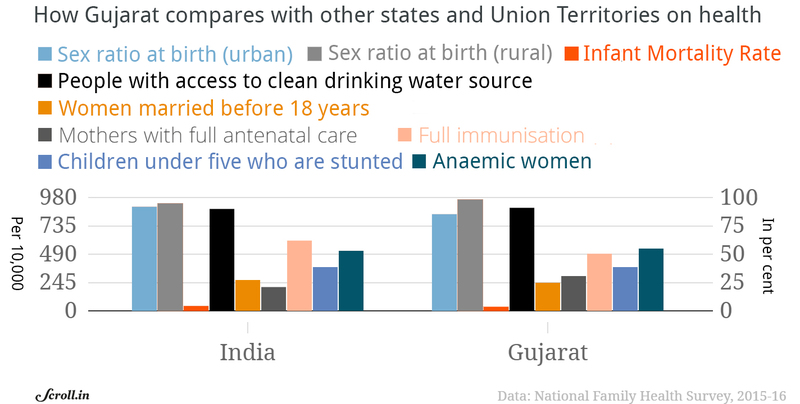 Particularly under the chief ministership of Narendra Modi, which lasted 12 and a half years, Gujarat saw extraordinary centralisation of power. As the human rights lawyer and activist Girish Patel said, one man’s word was final. As for the Assembly, Patel said, it was called only when constitutionally required. Between 2007 and 2012, the Assembly convened for just 31 days every year. As Gujarat’s people vote for a crucial Assembly election, the first after Modi moved to New Delhi as the country’s prime minister, five trends characterise the state’s political economy. 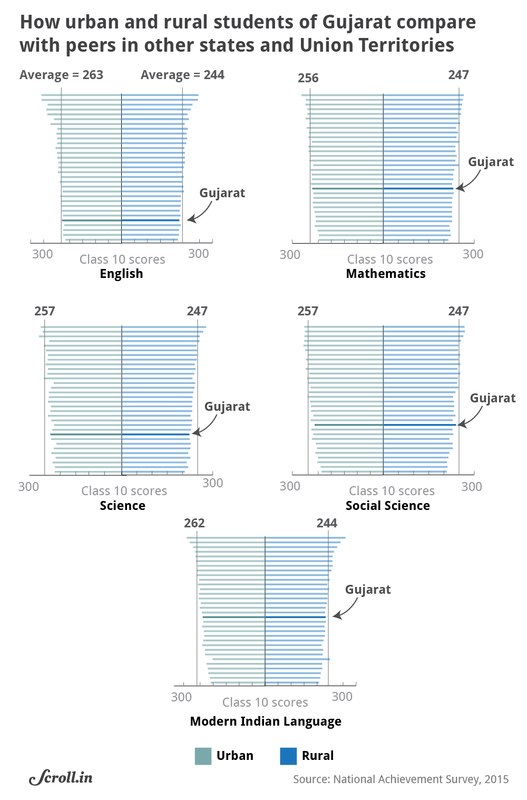 Take Gujarat’s low scores on health development indices. They are a puzzle. Most states with low human development scores are either cash-strapped like Punjab or unable to enforce their writ like Bihar. Neither condition applies to Gujarat. It has a healthier economy than Punjab and it is anything but a weak state. This is majoritarianism at play. In Gujarat, upper and middle caste Hindus are more affluent than minorities such as Muslims and Adivasis. Indeed, communities such as the Patidars have their own medical colleges and hospitals, which, said a sociologist based in Ahmedabad who did not want to be identified, can handle even complex procedures like knee replacement. Dalits, Muslims and Adivasis have been left out in the cold. This shows in the data. 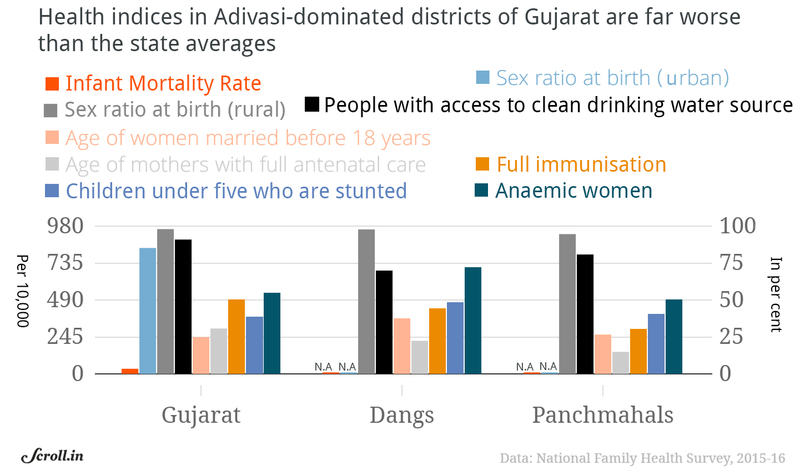 Health indices in Adivasi-dominated districts are far worse than the state averages. 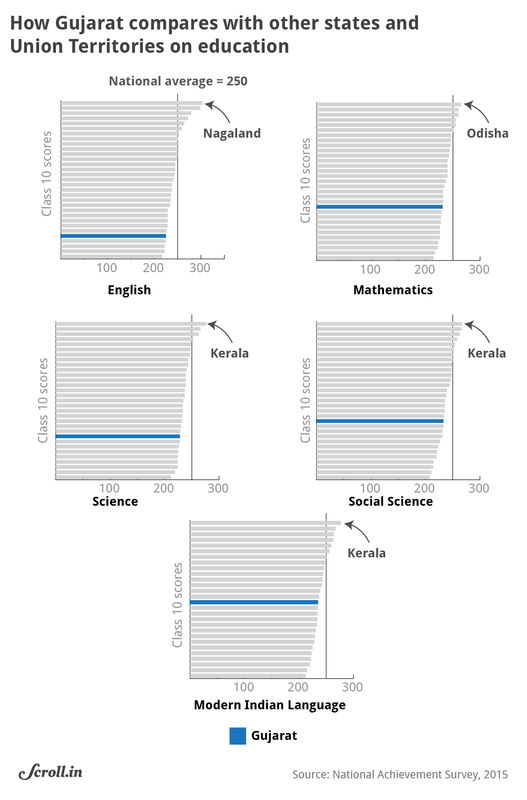 So are the grades for rural, Scheduled Caste, Scheduled Tribe and Other Backward Classes students. Such discrimination shows up in the work of the civic administration as well. Take the Muslim ghetto of Juhapura. Its roads, to take one example, are far worse than roads elsewhere in Ahmedabad. Another part of the answer could lie in the gradual normalisation of majoritarian thinking. The retired judge recalled an instance when he was about to deliver an order pertaining to a communal riot. A fellow judge told him they were waiting for his judgement: “Hum sab ummed kartey hain ki aap dharm ki raksha karengey.” We all hope you will protect the faith. In an interview to Scroll.in, political scientist Ghanshyam Shah said the Muslims have been isolated in Gujarat. This isolation is geographical (pushed into ghettos), economic (distanced from the state economy) and psychological. Religion is a marker that Muslims cannot escape. At the same time, there is a sense of vulnerability as a result of state actions like arrest by the police. The economically higher classes, he added, have softened towards Modi. Some business communities have even taken BJP leaders as partners to hedge against furture damage by the state. There are other changes. When the Adivasis give their name, they include their Hindu name. A Rathuwa Adivasi will say he is a Hindu Rathuwa. The festivals and gods have changed as well. Adivasi houses in her area of work, Dubey said, used to have paintings of Pithora Devta – paintings inside the houses depicting horses, nature and the like. “You do not see them in the new houses,” she said. “Instead, tribals are celebrating Ganapati and Navratri much more.” This has especially increased in the last 5-6 years. Beneath it all, there is little actual development. 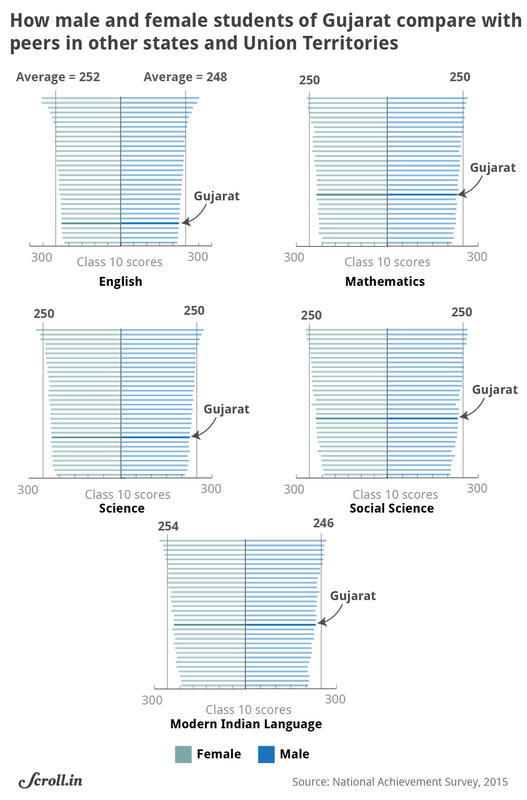 As the charts above show, learning outcomes and healthcare indices in tribal Gujarat lag behind the rest of the state. That is despite the state government rolling out programmes such as Van Bandhu Kalyan Yojana for tribal welfare in 2007. Similarly, in education, at the schools that Scroll.in visited in Panchmahals, teacher attendance has improved. 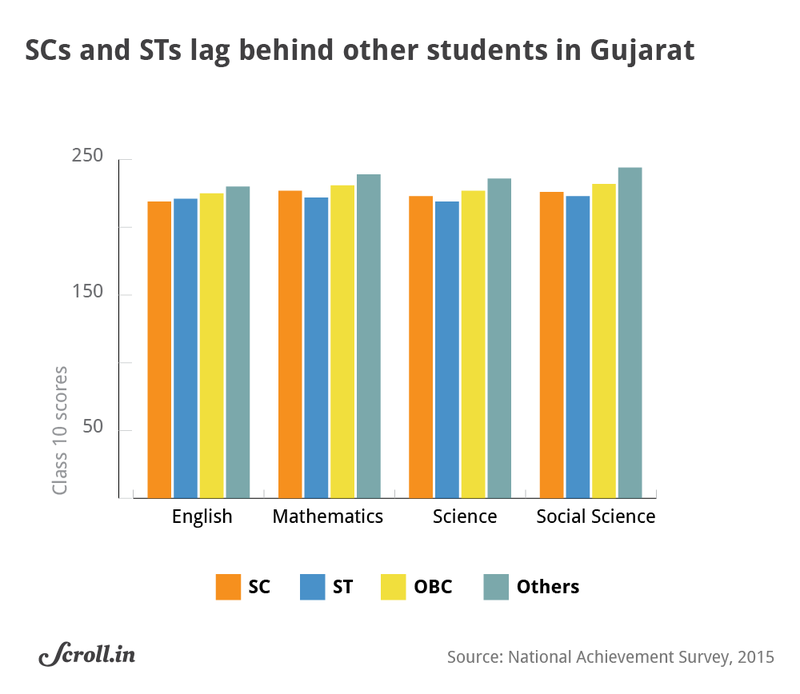 But look at reports on Gujarat’s learning outcomes and you will see they are still poor. Things get more complex when you look at the Dalits. The BJP’s project to mainstream them is struggling. In part because the majority community is struggling too. In the last five years, the state’s Micro, Small and Medium Enterprises sector has slipped into a crisis. Rural Gujarat is facing its own troubles. Groundnut farmers say they are being forced to sell well below the Minimum Support Price. One contributing factor here is especially worth flagging. Increasingly, Indian government policy protects large input producers at the cost of small companies making finished products. Take textiles. India has an anti-dumping duty for polyester chips and yarn – but not for finished polyester fabric. The fallout? Companies competing with Chinese fabrics are caught in a vise. Even as their domestic raw material costs stay high, Chinese imports are pushing sale prices lower. Or take Saurashtra’s groundnut oil economy. It collapsed because India slashed import duty on palm oil, benefitting a handful of palm oil importers and countries such as Malaysia. 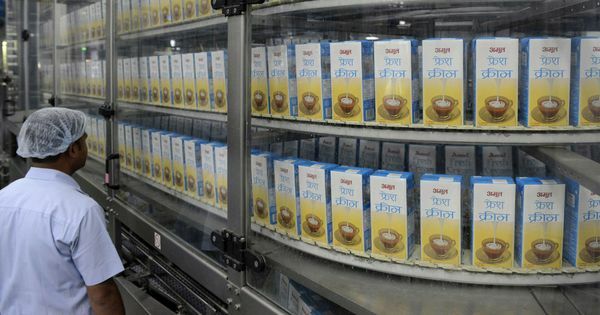 The fallout of these changes, said the sociologist based in Ahmedabad, is immense: the Gujarat money-making machine, he said, is slowing down. Public protests aside, people respond in their own private ways. 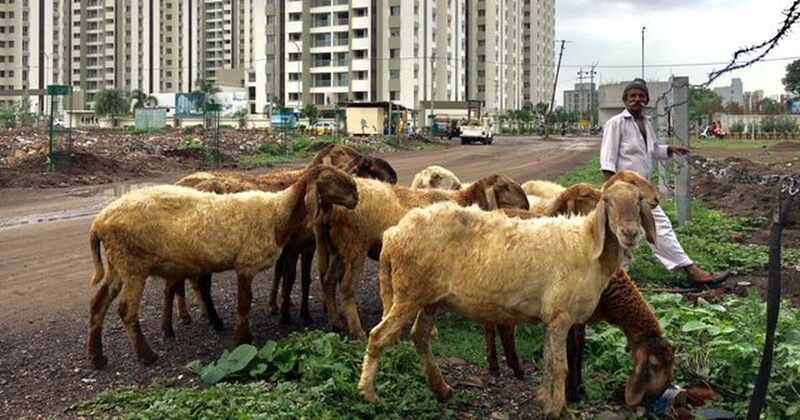 Gujarat is seeing rising migration from rural to urban areas. A growing number of businessmen are taking money out of their businesses and putting it in the stock market. After demonetisation and the roll-out of the Goods and Service Tax, this trend has accelerated. This accentuates the unemployment problem, contributing to agitations like the Patidars’. The conflict with Dalits, Shah said in his interview, occurs because the Patidars find themselves competing with them for the same opportunities. Clearly, the majority community is fissuring. This shows in a set of ways. 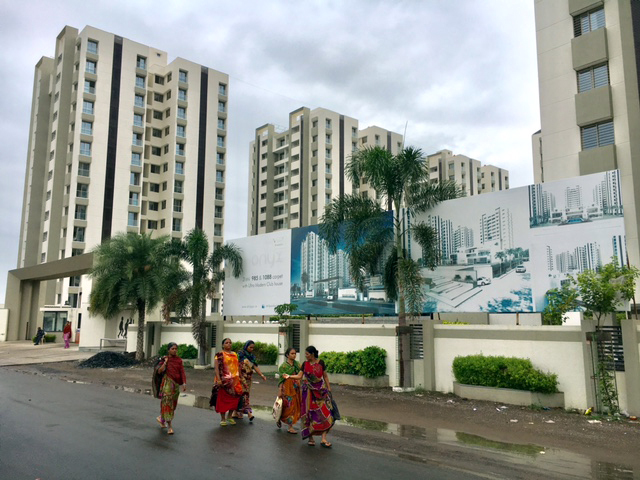 It is getting harder for Kadva Patels, for instance, to rent houses in a Leuva Patel colony. This is new, said Bhadrayu Vachchrajani, a sociologist based in Rajkot. “Before the Gujarat quake, we did not know which of our neighbours were Leuva Patels and which were Kadva Patels,” he added. This is also showing up in religiosity. Religious display is much more overt in Gujarat now. “Earlier, we never saw a juloos at Janmashtami,” Vachchrajani said. “Now, at that time, [all of Rajkot] is taken over by processions.” Further, many more people are going to religious sects headed by living gurus. At temples, said KK Kakhar, a retired professor in Rajkot, “You cannot see God. But, at the sect, one person embodies God. People’s lives have become less secure and so you go into a belief system.” This is similar to what we saw in Punjab, where people were looking for something more supernatural and immediately reassuring than the spiritual wisdom of the Guru Granth Sahib. The interesting thing about Gujarat is that some of these coping mechanisms only strengthen the BJP. Urbanisation brings people to cities, which are the BJP’s strongholds. Rising religiosity brings people to sects and that helps the BJP in two ways. One, as Yagnik pointed out, the sects are anti-Muslim. As such, they reinforce the Hindutva project. The sects also have a symbiotic relationship with the state. The Swaminarayan sect, for instance, is “growing all over the world and they need foreign policy support,” the Ahmedabad-based sociologist pointed out. “Also, as these sects become large, they also have fissures and factions,” he added. When a guru dies, competing factions need powerful friends to gain control of the sect. In Sri Lanka, Buddhist monks and the government had a similar symbiotic arrangement: in return for state patronage, the monks supported the attacks on the Tamil minority. In India, including Gujarat, we have sects issuing statements in support of government programmes. And so, while he was chief minister of Gujarat, Modi assiduously groomed the sects. He would “chair meetings and special functions of the Swaminarayan sect,” said Vachchrajani. “So much so that when the sect’s leader died, people remembered how close Modi was to him and said Modi should become its new head.” Rupani has done the same. This goes beyond politicians making a beeline for the top 20 or so temples in Gujarat. Dhanraj Nathwani, son of Parimal Nathwani, the Reliance Industries’ Group President overseeing Corporate Affairs and Projects, is vice-president of the committee managing the Dwarkadhish temple in Gujarat. Why would corporate bosses want to be managing temples? According to the sociologist, this adds to the company’s security in relation to the state government. “If they can control the Vaishnav sampradaya, it gives them a political advantage,” he explained. In many ways, this is India’s deep state. Put it all together and you have to wonder who has benefitted from Gujarat’s majoritarian project. This dynamic is what makes this Gujarat election different. The last 20 years have brought steady economic growth coupled with the BJP promising to keep the Muslims in check. (As the retired judge pointed out, “That police bandobast we see at the time of the [annual] rath yatra [in Ahmedabad]? That is to tell Hindus see how much we are doing to keep you safe.”) But even Hindu communities are struggling economically now. In large part due to the focus on big business, GST and demonetisation. So, can majoritarian sentiment override anger over economic losses? Of course, the BJP controls sects and temples, urban areas and cooperatives. It quashes dissent and discourages critical commentary. Yet, travel through the state and you encounter much public anger against the BJP. The Akali Dal, remember, exerted similar control over Punjab’s apex religious body, the Shiromani Gurudwara Prabhandhak Committee, but lost the election anyway.